Some Resist Change; Some Embrace It…. SOURCE: Apple Pay catches the attention of retail customers. I have been personally reminded lately of just how adamantly some people resist change while others embrace it. Some don’t accept even the simplest changes in their lives without serious complaints. The smallest changes can set them off. And then there are others who are bored when nothing changes on a regular basis. They welcome change; they even embrace it. Apple Pay will be one of those issues. It is a much simpler and more secure way of paying but it does require a change in how we do it. For that reason there will be some who rant against it. Apple Pay is just getting started down a long road of implementation. Only iPhone6 currently has the capability of using it so its coverage is somewhat limited right now. 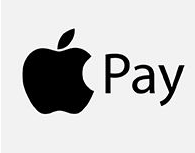 But as more and more people upgrade and more discover the ease of use of iPhones this payment method will move swiftly into the main stream. I upgraded my iPhone last week. I had been using an iPhone 4 for three years now and was ready for the change. The new phone has some nice new features and some added capabilities for those of us who are deaf and the bigger screen is certainly welcomed for these old tired eyes. 🙂 One of the first things I did was to set up an Apple Pay account. Although I have not yet used it, it is ready to go. I live in a small town with about the only retailer of any size being Walmart and since they are one of the ones who are currently resisting the change it might be a while before I use it on a daily basis. I Can’t Do It For Them…. This is going to be an extremely soul-searching post for me. It has been a week since the GOP route in the mid-term elections and I have been thinking about my philosophical and political leanings. Two things seem now apparent to me that were not so just a few short months ago. The first epiphany is that I am not so much a Democrat as I am anti-Republican. There is just too much weight amongst the current Republican party in favor of the elite and so little for the average guy and almost nothing for the guy down on his luck. In my mind too many who currently represent the party believe in the mantra “I’ve got mine so screw you”. They seem to think that if you can’t do what they did then it is your own fault. Too many, like Mr. Ryan of Wisconsin, just have no empathy for others.. The Republican brand is quite simply tainted too much for me. I call myself a social progressive and a fiscal conservative. If only the Republican party would stick to their strengths of being a watchdog of the purse and get away from trying to enforce, or you could say mandate, various versions of 19th century morals on the rest of us. By the same token if only the Democratic party would get over the idea that throwing money at any situation will solve it. The second epiphany is that I have come to understand that “I can’t do it for them”. That is I can’t help people who won’t help themselves. The majority of those who bothered to get out and vote recently were old and white like me. The young, the disenfranchised, the guy working one or maybe minimum wage job stayed home. He/she didn’t see it worth their time to make an effort to vote for the change makers. I want to see everyone have healthcare while I currently have very good coverage via Medicare and an affordable supplemental policy. I want to see everyone who works full-time be paid a living wage while I am fortunate enough to have Social Security, a good pension from thirty years with the same company, and a savings account beyond most my age. I want to see a strong safety net under those who might fall on hard times. I want to see that their families don’t get severely punished for something they had no control over while I, at least in my adult life, have never needed a safety net. I just overflow with empathy for others where it seems most in this country are more into the survival of the fittest mode. Maybe empathy is a condition I need to overcome, I don’t know. I’m sure that many that I advocate for think they are helpless in changing things. They just can’t seem to realize that in the end their vote has as much weight as the billionaires who they presently allow to control the money. Maybe it is time for me to get off my empathy horse and not worry about all this stuff so much. I simply don’t know the answer to that right now. I imagine I have about one more decade on this earth. Maybe I should spend it differently than I have been up till now? But I’m just a simple guy so what do I know…. I have not looked at any politics of the day for more than a week now. I have even reconfigured my daily internet reading to remove politics as a point of focus. That alone has helped to significantly brighten my general attitude toward daily living. To complete this refocus I have decided to take the blog in a slightly different direction. I will no longer be talking much about the politics of the day but will instead be concentrating more on things more positive. Things like what makes us who we are, and of course a usual dosage of Will Rogers and other memorable quotes will be more prominent. We will see how this goes. Another change is that I will no longer feel obliged to acknowledge or discuss every comment that comes into the blog. Many comments you make can certainly stand on their own and some others are probably best left untouched for other reasons. Now don’t get me wrong I appreciate your thoughts and insights. They certainly add value to the discussions so please don’t see my lack of response as a negative. I hope you will hang around for this repurposed journey. From looking at statistics of individual posts I know that focusing less on politics and its resulting conflicts will cost me some general blog hits but that is ok. I need to get off any fixation that still might linger for that anyway. As my header says, I will now be looking more at the other 99% of life “from a different angle”. I don’t know what level of political discussions is best right now. I will have to see how this goes. I would certainly welcome your opinions on this new approach to RJ’s Corner. It will be a delicate balancing act to post things that are relevant to our lives without becoming a fluffy feel good site; there is nothing fluffy about me…. I hope you enjoy this new path as much as I think I will. After visiting RJ’s Corner in the coming days you will at least go away no more gloomy than before you visited. That promise I will try to keep with every future post. I am going to tell you up front that this post is a little whacky but then again that is the type of person I am. I am always asking questions as to why things are the way they are. This idea is a paradigm shift that very likely will never happen. The Passing of an Era….. Source: AT&T sheds directories, advertising business | Mobile – CNET News. Things are in constant change now days. Sometime the pace is dizzying indeed. Of course telecommunications is one of those things that is probably changing the fastest. In the 1960s you could find a public telephone booth on almost any city street. In the 1970s the Trimline telephone was being made at a rate of one million a week. Picture phones were available but at a $2,000 per month rate. In the 1980s almost every household finally had a landline telephone and a very few had a “mobile” telephone which at time cost around $300 per month. In the 1990s cordless phones were replacing the corded version in the typical American home and cellular service was just beginning. By 2000 cellular phones were becoming common place. By 2020 it is speculated that the country will be pretty much converted from landline to completely cellular service. So I guess AT&T giving up its Yellow Pages is just a minor nick in the change but it just won’t seem the same without “letting my fingers walk through the Yellow Pages. 🙂 But then again, I don’t think I have opened last years version of the Yellow Pages. I now look up everything on the Internet. 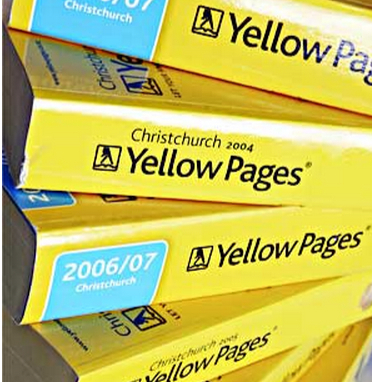 Goodbye my Yellow Pages friend. You served me well but your time like so many things now days has come to an end. Source: The U.S. 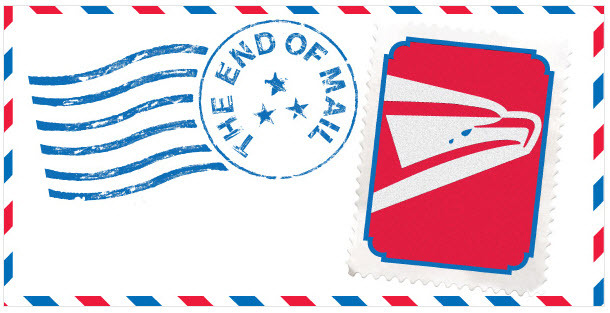 Postal Service Nears Collapse – BusinessWeek. Too bad the person who wrote this article didn’t snail mail it to everyone. It is seven pages long so it would have brought in big bucks to the USPS. 🙂 Seriously though (at least as serious as I get on this blog) the postal service is in pretty deep trouble and it is not going to go away. I am usually pretty tolerant of government agencies but this one needs to reign back its scale and look to other ways to provide its services. There are just too many post offices around that do little or no business. As I mentioned before there is a post office in a little town near us where it is now the only business in a town of about two dozen houses. Most small town post offices could easily be incorporated into some existing businesses such as the local thrift/gas store. I can remember when I was a kid that the post office was in the local food store. As the article mentions the USPS now handles more junk mail than first class and that will continue to be a downward trend for them. I like almost everyone else pay most of my bills on-line now and of course those personal letters to past family and friends has long since been replaced by email, Facebook, and other such services. I can see the time in the not too distant future where first class mail, like buggy whips, will basically cease to exist being totally replaced by its electronic cousin. About the only thing that is keeping that from happening today is the lack of adequate Internet connections to those of us who live in rural America. This is yet another instance where we can learn from our neighbors around the world. As mentioned in the above article most of the European postal systems have already morphed into quite different services. Many are quite profitable and something we could easily mirror here in the U.S. One of the basic problems with our current system is the postal union seems to be against any significant change. I am definitely a person who believes in workers being collectively represented but that does not mean they must resist change, even changes that will reduce their ranks, when it is obvious that is what is needed. I know we need more middle class jobs here in the U.S. but stubbornly hanging on to ones that have outlived their usefulness is not the answer to this problem.